We’d love your help. Let us know what’s wrong with this preview of Velvet Elvis by Rob Bell. To ask other readers questions about Velvet Elvis, please sign up. 1) I really like Bell's enthusiasm and passion for helping people break out of a religious system that many times can be boring and basically anything but alive. Sometimes I think that I myself am far too intertwined with this system which, although good in many ways, is still man-made. 2) Bell's call to "test it. Probe it." is good advice. I have the awful tendency to read books, accepting most everything that I read as long as I trust the author or person who recommended the book to me. 3) I thi 1) I really like Bell's enthusiasm and passion for helping people break out of a religious system that many times can be boring and basically anything but alive. Sometimes I think that I myself am far too intertwined with this system which, although good in many ways, is still man-made. 3) I think that the way we respond to testing and probing is what can separate believers from non-believers, but unfortunately it doesn't. As you'll see below, there are some very big disagreements I have with Bell, but some of the things I've seen written and done in protest of his teachings is unbelievable. Protesting outside Bell's fellowship telling people they're going to hades isn't much of a disagreement, it borders on hatred. 4) All that being said, I have some very significant problems with some of Bell's theology. The first is his use of the trampoline analogy. Now obviously no analogy can be perfect, but the statement that all tenets of faith outside of Jesus are springs, and therefore we must be willing to allow them to flex, is very unBiblical. Now I agree with him regarding the man who said that if you don't believe in a 24-hour day creation, you don't believe in the cross. If by springs he means that we need to be open to various interpretation, I am all for that. It is when he wants my foundation to flex that I have a problem. Speaking of the virgin birth he says, "What if that spring was seriously questioned? Could a person still keep jumping?" My personal answer is that if I found that the virgin birth was untrue, the gospel writers knowingly putting a myth into their writings and thus compromising the inspiration of the Word, yes I would have some serious questions. But my personal answer doesn't carry as much weight as Paul's in regard to the resurrection saying, "...if [the Son] is not risen...then your faith is also vain." (I Cor 15:14). That doesn't sounds like a spring to me. I believe there are certain things which are bricks, or if I may add to Bell's analogy, maybe the stands on which the trampoline is raised. You take that away and you'll find that jumping on the trampoline is no different than jumping on the regular ground. 5) There was something that bothered me all through the first half of the book which I couldn't put my finger on until he basically wrote it out. Although I admire Bell's passion, I'm wary of his focus. Although he's not fully a "saved by works" preacher, he gets far too close in my mind by not emphasizing the power of the cross. Like I said, I couldn't put my finger on it until he got to his theory about Peter walking on water. That just blew my mind. Bell states, "Who does Peter lose faith in? Not Jesus; Jesus is doing fine. Peter loses faith in himself." The idea that the Son willingly gave up His life so that people like me could realize how great I already am and all of the things I am capable of borders on blasphemy. In response to that I want to ask Bell what happened when Peter got back into the boat. Did he apologize for not meeting his potential? Did he promise that next time he would be more confident in himself? Of course not. He worships the Son. "I can do all things through Christ who strengthens me". I think those two words were missing in too much of Bell's ideology. 6) Bell far too often portrays the Word as full of metaphors. Yes, we desperately need to find the relevance for today, to apply it to our lives. I agree that this might be why so much of our "system" seems dead. However, what gives me hope in the life to come is not a personal, very subjective "...experience of [the Son] that transcends place and time" as Bell says, but rather the fact that the Son died and rose again on my behalf. I think the writers themselves make it clear that their purpose wasn't to provide metaphors, but to give us the story of our existence. Luke says, " Therefore, since I myself have carefully investigated everything from the beginning, it seemed good also to me to write an orderly account for you, most excellent Theophilus, so that you may know the certainty of the things you have been taught" (Lk 1:3-4). I think this book has tremendously helpful applications. There are so many challenges that are expressed through the genuine reflection of the current state of Christianity. The challenge to think deeply and to ask questions about what Christianity is and what it means. These are helpful bits of advice. There are great nuggets of wisdom that challenge people to read the Bible with the understanding that the events themselves really did happen. They are real stories about real people in real plac I think this book has tremendously helpful applications. There are so many challenges that are expressed through the genuine reflection of the current state of Christianity. The challenge to think deeply and to ask questions about what Christianity is and what it means. These are helpful bits of advice. There are great nuggets of wisdom that challenge people to read the Bible with the understanding that the events themselves really did happen. They are real stories about real people in real places. Moreover, the challenge to live authentically is prevalent within the writing of Rob Bell. One can truly appreciate his candid way of expressing his ideas and concerns. Recently, I've been doing a lot of writing concerning my own beliefs and faith practices. It tends to come up occasionally amongst my group of friends, as I'm one of only a few (if any?) practicing Christians, and I tend to think a lot about faith issues generally because my church tends to be very thought-provoking and inspiring. About a month ago, I emailed one of my writings to my pastor, almost half-expecting him to call me a nutter and suggest I not return. Instead, he said "Read this book, Recently, I've been doing a lot of writing concerning my own beliefs and faith practices. It tends to come up occasionally amongst my group of friends, as I'm one of only a few (if any?) practicing Christians, and I tend to think a lot about faith issues generally because my church tends to be very thought-provoking and inspiring. About a month ago, I emailed one of my writings to my pastor, almost half-expecting him to call me a nutter and suggest I not return. Instead, he said "Read this book, I think you'll love it!" Sometimes, especially living in the conservative midwest, I become convinced that my views on the state of modern Christianity and on faith and belief in general are "out there," "wacky," or downright sacreligious. It's very nice to be reassured that, all of a sudden, I appear to be part of a "movement." There really are people out there reading their Bibles and NOT falling into the psycho-fundie trap! There really are people out there who think that Jesus' message and mission are a damn sight more important than traditions that end up driving more people away from God than drawing them in. There really are other folks who realize that the bottom line isn't how many rules you follow correctly, but (oh what was it that crazy kook called Christ said??) "Love the Lord your God" and "Love your neighbor as yourself." At the core of Rob Bell's teachings is the historically-focused practice of humble questioning. He points out that in the Judaic tradition of Jesus, learning was more than just rote memorization - you were *supposed* to answer a question with a question. Furthermore, the faith tradition of Jesus was always intended to grow and change with the times... and it always has! It's an easy trap to fall into, to accept the revolutionary teachings of a wise predecessor, and forget that they *weren't tradition* when they were first suggested. This book had me almost constantly smiling, and not just because Bell was simply eloquently stating my own thoughts. His writing style is casual, conversational and accessible. His history was in-depth enough to engender trust, yet interesting enough to make me want to actually read up on ancient Judaic practices myself! It would be a great book for anyone who is new to Christianity, and CERTAINLY for anyone who finds themself put off by the current public face of the faith. Keeping in mind that this is the first "Christian" book I've ever finished and that I loath going into "Christian" stores and purchasing things produced by "Christian" companies my review of this book will consist only of a single idea portrayed in the piece that is worth all four of the stars I gave it. If you woke up tomorrow and there were irrefutable evidence that Mary, Mother of Jesus, was NOT a Keeping in mind that this is the first "Christian" book I've ever finished and that I loath going into "Christian" stores and purchasing things produced by "Christian" companies my review of this book will consist only of a single idea portrayed in the piece that is worth all four of the stars I gave it. If you woke up tomorrow and there were irrefutable evidence that Mary, Mother of Jesus, was NOT a virgin would it discredit all that Jesus Christ taught and did? This idea BLEW my mind. The idea that all of the Christian faith is built up like a wall, some of us are in and some of us are out and some us us think "evangelism" simply means pulling people to our side of the wall and "saving" them. Furthermore the idea that if a brick were to be removed from the wall (i.e. Mary NOT being a virgin as we understand it) would cause the whole thing to shake and eventually crumble. This idea is so powerful to me that it redeems any shortcomings this book may or may not posses. If you think yourself a Christian than I challange you to consider the idea of "repainting" the faith with Rob Bell. After reading Rob Bell’s Velvet Elvis and a few ranting and raving reviews, I’m not going to comment on the fine points of Bell’s theology. Some are fine, and some are brittle. But, I would like to comment on the spiritual trampoline metaphor from my own experience. I had a friend who owned a trampoline. We neighbor kids spent many hours at his house. It was amazing to watch him do flips. He could go forward and backward as high or as low as he wanted. He tried to teach me. I could only manage t After reading Rob Bell’s Velvet Elvis and a few ranting and raving reviews, I’m not going to comment on the fine points of Bell’s theology. Some are fine, and some are brittle. But, I would like to comment on the spiritual trampoline metaphor from my own experience. I had a friend who owned a trampoline. We neighbor kids spent many hours at his house. It was amazing to watch him do flips. He could go forward and backward as high or as low as he wanted. He tried to teach me. I could only manage to do a low, forward roll (is that a somersault?). I’m 6’2,” and I’m just not that flexible. So, I knew when to sit on the edge and watch him flip. I knew when to jump with him, the two of us feeding off a unified rhythm. It was great fun. Until, one of our friends fell off and broke her leg. She healed, but the trampoline wasn’t as thrilling anymore. It was still fun, but not as fun. I didn’t turn into a complete coward and never jump again. But, I was certainly more careful when I did. I also learned trampolines aren’t for everyone. I have three boys. My oldest—who is naturally cautious—and my youngest—who jumps with or without a trampoline—would probably be just fine. But, if my middle son—who has balance issues even when walking—got on one, we might as well file an insurance claim in advance! So, I think this metaphor is a good one for this book. I’m thankful to Rob Bell for the opportunity to jump with him on his spiritual trampoline awhile. He certainly knows how to flip forward and backward better than I ever could. So, I’ll remember those moments of unified rhythm, but I also know I’m not as flexible as he is. And spiritual trampolines aren’t for everyone. For those cautious and more experienced jumpers? Maybe. For those who struggle with simply walking? No. My recommendation is just choose carefully when inviting someone to this spiritual trampoline. Trendy to be trendy. I felt like Rob Bell was trying to be different, when there was no other reason than to fool people to think he is trendy. Maybe it was his way of hiding is wishy washy Christianity. Allowing people to question the virgin birth and divinity of Christ is a grievous error. I am sad that so many people have been deceived by some "trendy", but not truthful writing. Beyond the theological errors, I felt like I was just trying to finish the book the whole time. I took issue with enough in this book that I stopped reading it in the middle of chapter 3. I am watching the Nooma video series that Rob Bell does so I decided to read this book to understand his theology. I was concerned. For one, I found often that his analogies or explanations were so vague that I often wondered "and what does that mean!" Unfortunately as I read Velvet Elvis, I actually found myself getting bored with Christianity...taking out the element of faith in God feels like taking out the adventure. Bell's theology diminishes the sovereignty of God, the historical reality of I am watching the Nooma video series that Rob Bell does so I decided to read this book to understand his theology. I was concerned. For one, I found often that his analogies or explanations were so vague that I often wondered "and what does that mean!" Unfortunately as I read Velvet Elvis, I actually found myself getting bored with Christianity...taking out the element of faith in God feels like taking out the adventure. Bell's theology diminishes the sovereignty of God, the historical reality of the Bible, and gives a skewed description of human nature [particularly in the passage about Peter walking on water... that it was losing faith in himself that made him sink...why then did Peter worship God when Jesus rescued him and took him back to the boat? It was Jesus's enabling that Peter was able to walk at all!] Rob Bell dilutes the offensiveness of the Gospel in order to make it seem more applicable and palatable to post-moderns. Faith is never easy but it cannot be written off. On the other hand, I agree with Bell full-heartedly that God meets us and loves us as individuals. And it is important that we recognize the lenses we bring- our cultures, our generation, our own personal stories- as we enter into relationship with God, as we read Scripture, pray, attend church, or whatever. I also appreciated the way Bell speaks about the mission of the church, bringing Heaven to earth. I do think that God invites us to participate in the renewal of the earth and I do really hope that we are living in a generation that will move beyond our church walls. This book was everything I feared it would be. I trust "emerging" Christianity about as much as previous iterations (boomers, mega churches, the religious right, etc)...which is to say, not much. Bell sounds just like every other emerging guy out there...interpreting the bible for himself based on personal experience, passion, and liberal use of unsubstantiated metaphor, rather than solid education, classical study, and reverence for the seriousness of the topic. I think on many issues, he has go This book was everything I feared it would be. I trust "emerging" Christianity about as much as previous iterations (boomers, mega churches, the religious right, etc)...which is to say, not much. Bell sounds just like every other emerging guy out there...interpreting the bible for himself based on personal experience, passion, and liberal use of unsubstantiated metaphor, rather than solid education, classical study, and reverence for the seriousness of the topic. I think on many issues, he has good points, but none of them are new or original and are based more on emotion or ego than on scripture. I'm not some old, uncool, bible thumper who is mad that 'emerging' thought is taking over...I'm a younger 'hip' Christian who is tired of all the 'new thinking' being just another 'movement' that will be discredited as soon as the next generation 'emerges'. On the shelf next to Blue Like Jazz: Nonreligious Thoughts on Christian Spirituality and Divine Nobodies: Shedding Religion to Find God. Makes you think about religion in a whole new way, challenging. I liked this book more than I expected. If I had read it years ago before knowing the direction Rob Bell has taken since he wrote this, I might have liked it a lot more. But because I have read some of his recent books, I couldn't help but 'fill in' some of his characteristic silences, pauses and rhetorical questions with the answers he has more recently provided. Overall: Rob Bell asks helpful, uncomfortable questions of the church establishment. It's his answers that aren't that helpful. He emp I liked this book more than I expected. If I had read it years ago before knowing the direction Rob Bell has taken since he wrote this, I might have liked it a lot more. But because I have read some of his recent books, I couldn't help but 'fill in' some of his characteristic silences, pauses and rhetorical questions with the answers he has more recently provided. Overall: Rob Bell asks helpful, uncomfortable questions of the church establishment. It's his answers that aren't that helpful. He emphasises those aspects of Christianity which have currency in our culture at present -- love, acceptance, forgiveness, grace etc. But he's very light on those elements of the gospel which are counter cultural -- e.g. Jesus death and resurrection to remove our sins and reunite us to God, a gospel that is distinctive, confronting and offensive to the world. It is easy to misunderstand Rob Bell, to fill the gaps with your own assumptions. Christian readers may assume the gospel message, and thus be quite encouraged. Non-Christian readers might assume a postmodern relativity and pluralism, and also be encouraged in their existing beliefs. Rob Bell builds great bridges to non-Christians, but does he ask people to walk over them, or does he stay on the other side and chat? I will say there was quite a lot of encouraging stuff in this book, mixed in with stuff I can't agree with. Chapter 1 was about the need to update Christian doctrine to make it relevant to contemporary society, so he lost me there. I think he overstates (significantly) the unknowableness of God and the open ended nature of the Bible. I quite appreciated the emphasis on the Jewish context of the New Testament in Chapters 2, 3 & 5. Chapter 4 was a great chapter on being real, letting Jesus heal your soul, seeking restoration (shalom) not just forgiveness -- I was encouraged by this chapter. I appreciated some of the content on our new identity and hope in Chapters 6 & 7, but that may have been because I was bringing a lot of underlying gospel assumptions to those chapters which were not explicitly present. I noticed the seeds of his rejection of Hell (fully developed in Love Wins) in a few places. This was my first theology book by a "modern" author. I suppose I shouldn't say modern, as that word is now associated with the thinking patterns from 1800-2000ish. But some people are getting tired of "post-modern," and even "emerging" has its connotations. This was my first theology book not written by a super-conservative Christian who wants you to wear a tie to church. My first reading (3 years ago) really stretched my thinking about all the issues addressed. Since that time (in which Claiborn This was my first theology book by a "modern" author. I suppose I shouldn't say modern, as that word is now associated with the thinking patterns from 1800-2000ish. But some people are getting tired of "post-modern," and even "emerging" has its connotations. My first reading (3 years ago) really stretched my thinking about all the issues addressed. Since that time (in which Claiborne and McLaren have become household names), my thinking has stretched a bit. And I can't remember the last time I wore a tie to church. This time through I found nothing very new anymore. It seems as if the concepts in this book have either become the new standard from which everyone else springs off and just assumes to be true, or else it was written when these things were already assumed to be true and was simply a basic primer for those (like me) who were unfamiliar with these concepts and perhaps hostile to anything which may have been seen as "liberal." I was especially touched this time through by Bell's reminder that all truth is God's truth, and so we should claim and embrace truth wherever we find it. If something appears to be true but doesn't necessarily fit our belief system, then we need to change our belief system. Our "belief system" should be flexible enough to allow that. I was also encouraged by the author's recommendation to dig into my soul and deal with all the junk I find there. He states that very few people actually live from their heart, but those who do are the ones who make a difference. I'm not sure how to begin that process, but I know it needs to happen. He speaks of having “as many questions as answers” about his faith, and about “contributing to the discussion” rather than trying to provide definitive answers. So far I am wholeheartedly with him; I am with him in many of his questions, and with him in many of his answers. “…embrace the Bible as the wild, uncensored, passionate account it is of people experiencing the living God. In a similar manner he discusses quite a wide-ranging selection of other issues. So far, so good. The style and content is not that of a theologian or scriptural scholar, it is the work of a preacher and each section is written like the transcript of an extended sermon. In many places this is effective and helpful. However, there are considerable short-comings to the book. At a less important level there is a jarring quality in the tone, in the sense that he adopts a ‘cool’ or ‘hip’ way (or whatever the current phrase is for such speak – afraid I show my age here). Such assumed tones always leave me with some suspicion, maybe unjustly so, that at least some of the content is assumed and manipulated to target an imagined audience. But why the lengthy baloney first? More seriously his style of argument often lacks precision and solid basis. Many of his statements appear to be plucked out of the air with no supportive evidence provided. What?! In Biblical imagery we may find near the beginning of Genesis a garden & at the end Revelation an eternal city, but this isn’t related to symbolic imagery of the bible, nor is it related to any aspect of history. What is the man on about? This may be the ideal, but Paul’s letters sent to these very same communities are constantly stressing those qualities alongside the failure of those communities to live up to them. reduced the effectiveness of his message. Did I enjoy this book? Yes and no. Do I think this book makes a valuable contribution to Christian literature? Yes and no. Firstly, there is nothing exorbitantly wrong in this book. I think there are ideas in it which are over emphasized and exalted maybe a little too much. I like Rob Bell's vision of reaching out to people where they are and giving them the opportunity to experience a relationship with Christ ad then gradually come into a full knowledge of Christianity. It makes sense. That's how Did I enjoy this book? Yes and no. Do I think this book makes a valuable contribution to Christian literature? Yes and no. I like Rob Bell's vision of reaching out to people where they are and giving them the opportunity to experience a relationship with Christ ad then gradually come into a full knowledge of Christianity. It makes sense. That's how it goes. First milk, then solid food. I like that he talks about the need of understanding the setting, the cultural values of the time, and so on to be able to understand the Bible better. I like that he encourages people to think critically and discern what they take in. He even exhorts the reader to do this with his book! I don't like that his idea of a fluid faith (the whole spring analogy) that is growing and adapting seems pretty flimsy. It's hard to get an idea of just how far he might "Repaint" the Christian faith. I don't like that his writing seems to speak of an idea that the Bible is almost unreadable without the full context of history and a full knowledge of the bible. Yea, the Bible is a difficult book, and there is a lot of nuances, treasures in scripture to be gleaned, and even things to stumble over. But, the bible is also pretty straight forward in a lot of areas. On this note I do like that he does talk about studying the Bible in community. That's a good idea no matter the other things. Lastly, I'm not sure I understand Rob Bell's eschatology (the stuff that happens at the end of the world). He talks a lot about either bringing heaven here now or bringing hell here now. It seems a bit... odd. It just doesn't sit right. Rob Bell has enormous influence and this book enjoys enormous popularity. Unfortunately, I think the truths that are in this book to claim are surrounded by a lot of mis-truth or at the very least unclear truth. I read it/studied it 5 times (underlined, highlighted, scribbled 6 pages of interesting quotes) trying to understand what my friends find so intriguing about this disillusioned "post-Christian" and what he is trying to propagate. I finally came to the conclusion that he spends the pages playing devil's advocate, both discrediting and disproving the foundations of Christendom, (i.e. Virgin birth, resurrection of Christ, authority of Scripture, etc.) Fine by me...believe what you want...but after I read it/studied it 5 times (underlined, highlighted, scribbled 6 pages of interesting quotes) trying to understand what my friends find so intriguing about this disillusioned "post-Christian" and what he is trying to propagate. I finally came to the conclusion that he spends the pages playing devil's advocate, both discrediting and disproving the foundations of Christendom, (i.e. Virgin birth, resurrection of Christ, authority of Scripture, etc.) Fine by me...believe what you want...but after successfully disproving it, he says that he still believes it. What the freak? Either believe it or don't. That would be like Al Gore going around striving to DISPROVE Global Warming and then wrapping up the lecture by saying "However, I believe that it is happening". One of the many memorable quotes of the book is when he is quoting "one of the great 'theologians' of our time", Sean Penn, when he said "The mystery is the truth". WTF? I have been rather reluctant to start this book, but last night I could barely put it down. The book really does attempt to "repaint the Christian faith" by asking questions and exploring different interpretations of scripture in such a way that would probably offend many traditional churchgoers today. In my own search to find some reality in the church and my own relationship with God, this book comes at a perfect time, reassuring me that it's ok to ask questions, it's ok to doubt. This would r I have been rather reluctant to start this book, but last night I could barely put it down. The book really does attempt to "repaint the Christian faith" by asking questions and exploring different interpretations of scripture in such a way that would probably offend many traditional churchgoers today. In my own search to find some reality in the church and my own relationship with God, this book comes at a perfect time, reassuring me that it's ok to ask questions, it's ok to doubt. 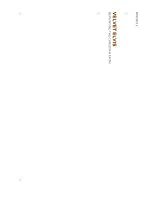 This would really be a good read for someone who is on the fence about Christianity, someone who is tired of the Church as it exists today with it's outdated legalities, or someone who just wants to gain a refreshing perspective on their faith...more to come! Rob Bell is an interesting Christian leader. I hold some negative opinions toward the "Emerging/Emergent" church--I don't particularly care for the way they obsess about marketing Jesus. In general, the movement treats Jesus as a product and although they advertise Him in a very attractive way, I don't think that's the point. Bell brings up a lot of good points in this book. He challenges readers to think and use their minds and "test everything." I think a lot of Christians could benefit from hi Rob Bell is an interesting Christian leader. I hold some negative opinions toward the "Emerging/Emergent" church--I don't particularly care for the way they obsess about marketing Jesus. In general, the movement treats Jesus as a product and although they advertise Him in a very attractive way, I don't think that's the point. This book was very challenging, and enlightening. Rob Bell details many aspects about Jewish life, such as their beliefs and practices and how they relate to Jesus' interaction with the Jews, about which I was previously unaware. This book helped me better understand Jesus' teaching and what his words and actions truly meant to those who were present for his teaching 2000 years ago. it's a great book, and it reads very quickly. You, whoever you are, should check it out. The title of this book is drawn from an illustration that Rob Bell uses to explain the purpose of his book. In his basement he has a velvet painting of Elvis Presley. Bell uses the painting as an illustration for the book's subtitle: "Repainting the Christian Faith." What if the artist who created that painting had said it was the ultimate painting and no more paintings could be done by anyone? Art is not meant to be "frozen"; neither is the Christian faith. There is nothing wrong with the "pain The title of this book is drawn from an illustration that Rob Bell uses to explain the purpose of his book. In his basement he has a velvet painting of Elvis Presley. Bell uses the painting as an illustration for the book's subtitle: "Repainting the Christian Faith." What if the artist who created that painting had said it was the ultimate painting and no more paintings could be done by anyone? Art is not meant to be "frozen"; neither is the Christian faith. There is nothing wrong with the "paintings" that have been done. But for those that need a fresh view of what it means to be a follower of Jesus, Bell offers his story and his vision in this book (pp. 013-014). "Everybody has faith. Everybody is following somebody." When Jesus said he was "the way, the truth and the life" he was saying that his way of life is the best possible way for a person to live." It is "the way to the depth of reality." The doctrines of the Christian faith are like the springs of a trampoline. Jumping on the trampoline is analogous to how we live our life. The doctrines help give words to the depth of our experience of following Jesus. Our words about the faith are not absolute. Only God is absolute. "Doctrine is a wonderful servant and a horrible master." Christianity must allow room for questioning and doubt in order to truly pursue the living God. The Christian faith isn't like a wall of bricks that might topple over if one or two bricks (doctrines) are pulled out and questioned. He's not talking about "belligerent, arrogant questions that have no respect for our maker, but naked, honest, vulnerable, raw questions, arising out of the awe that comes from engaging the living God" (p. 018-31). In this chapter, Bell discusses the nature of interpreting the Bible. The idea that there is some objective, unbiased interpretation of what the Bible means is a problem for Bell. For example, what does the command to love your neighbor as yourself in Leviticus 19:18 mean for us today? We have to know what is meant by "love", who is our neighbor and what it means to love ourselves. The meaning of all these things depends on the context in which they are done. That is the point of Jesus saying that he did not come to abolish he law, but to fulfill it (Matt. 5:17). He came to live it out in the context of the time in which he lived. The Bible has to be interpreted in order to apply it to the context in which we live. The Bible is alive; it is open-ended (p. 046). It is not just about things that happened a long time ago, but about things which also happen today. The Bible gives us a picture of what it is like when he works through actual people (p. 065). When we come under Jesus' "yoke," we are living out his teachings in our own context. We interpret the Bible with our lives and for our life. Bell's approach to truth follows that of philosopher Arthur Holmes; "All Truth is God's Truth". Real truth is to be found everywhere, even among those who are not Christians, and it is God's truth. As Christians, we are free to claim truth of God wherever and whenever we find it. Jesus' saying that he is the way the truth and the life (John 14:6) is not the exclusive statement that many Christians take it to be. He is saying that all truth, wherever it is found, originates in him (pp. 080-2). When Jesus says that, "No one comes to the Father except through me", he is saying that he is the basis of all reality. "His life is our connection to how things truly are at the deepest levels of existence" (p. 083). From this it follows that "'Christian' is a great noun but a poor adjective", "It is impossible for a Christian to have a secular job", and the business of Christians is not to bring the world to the church but to be agents of transformation in the world because "the whole world is filled with the kavod [glory:] of God." (pp. 084-5). When Bell and others started Mars Hill Bible Church, he insisted that they not put a sign out in front. People had to want to find them. The church grew tremendously by word-of-mouth only. Bell recounts how, at one point, he was ready to run away from it all. His responsibilities at Mars Hill had completely overwhelmed him and he found himself sitting in a storage room between church services, wanting to get into his car and get as far away as possible. He had been trying to be "superpastor" and it was ruining him. A counselor told him that his problem was sin; he needed to repent of anything he was trying to do that was beyond what God made him to be. And he needed to be healed of his tendency to overextend himself. He needed to touch the fringe (tassels) of Jesus garments, so to speak (Matt. 9:20, 14:36) and be healed. He learned the importance of only trying to be what God was calling him to be and communicating that to others. This freed others up to find their place in the ministry of the church and serve in areas where they knew Bell could not (p. 116). Following Jesus means more than trying to know his teaching. It means trying to be just like him; to follow his way of life just as any rabbi's disciples did in the time that Jesus lived. Disciples often could be seen following their rabbi on the dusty roads and the dust kicked up by the rabbi's feet would cover them. When Jesus chooses us to follow him, as he chose his disciples, he is expressing confidence in us that we have what it takes (because he is giving it to us) to do the things that he does; to be like him. Jesus believes in us (p. 134). We need to be covered with the dust from his feet. God intends to make us into the new persons he originally intended for us to be. Bell wants us to avoid the trap of "sin management." Instead of focusing all our energy on avoiding sin, we try to understand what kind of person Jesus says we are. Sin is serious, but we need to repent of it and move on in the process of becoming the kind of persons who would naturally do and say the things that Jesus would do and say if he were living our life (p. 144). "For Jesus the question wasn't, how do I get to heaven? but how do I bring heaven here?" This should be our question as well. Hell is "a place, an event, a situation absent of how God desires things to be." Aside from whether hell has an eternal existence, it certainly has its place here on earth. Our goal as Christians is not to escape this world but to help make it the kind of place God intends it to be (pp. 147-150). God made the world good and "Jesus is God's way of refusing to give up on his dream for the world" (p. 157). He "isn't just interested in reclaiming his original dream for creation; he wants to take it further" (p. 161). The blessings God gives his people are always "instrumental." They are meant to be used to bless others in fulfillment of Abraham's calling in Genesis 12 (blessed to be a blessing). "The church doesn't exist for itself; it exists to serve the world." When Christians picket and boycott and complain about how bad the world is, it is toxic to the gospel. Serving the world is the only way its perception of the church will change (pp. 165-6). Christianity is not about making life easier. On the contrary, it will involve difficulty and suffering because we are not to give up on this broken world but are to become "more generous and disciplined and loving and free." We are to become the kind of people who can "[stare:] pain and suffering right in the eyes and refuse to believe that this is all there is" (pp. 169-70). It's a tall order; one that we must completely rely on God to fulfill. This is a great book. There are many important ideas in here that modern Christians need to think about. My only serious reservation with the book is its experiential approach to the value of scripture. For Bell, "the Bible is open-ended. It has to be interpreted" (Bell 2005, 046). This is true enough, but more traditional evangelicals would say that it has to be interpreted carefully and according to sound hermeneutical principles. This is something Bell certainly does in his sermons, but in his book he seems to present two false alternatives: "Is the greatest truth about Adam and Eve and the fruit that it happened, or that it happens?" Bell's answer is that it happens (p. 058-9). In this case, many could easily go along with him. Even some of the most conservative Bible scholars have no trouble seeing this story as an allegory rather than a historical event, but Bell's readers might easily assume that his point applies to everything in the Bible. Earlier in the book, Bell illustrates faith as a wall of bricks or a trampoline. If our beliefs are like the springs of a trampoline, they are flexible, open to question, and faith still functions if a few of the springs are removed. The problem pointed out by the brick wall analogy is that if our beliefs are like bricks in a wall, they are inflexible; the wall begins to weaken and crumble if a few bricks are removed (p. 022-8). The problem that Bell doesn't address is that some beliefs really are like springs (e.g., creation in six literal 24-hour days) and some are like bricks (e.g. the resurrection of Jesus). How do we tell the difference? I was surprised at how much of the time I found myself agreeing with Rob Bell. His central theme—that we can't continue to talk to people about faith and do things the same old way—is true. The way my parents talked about faith, entered into worship, and told others about God really just don't work in today's world. That said, I think Rob Bell starts out with a truth, but in taking his repainting of the Christian faith to the upmost extreme, he gets on some theological shaky ground. He suggests I was surprised at how much of the time I found myself agreeing with Rob Bell. His central theme—that we can't continue to talk to people about faith and do things the same old way—is true. The way my parents talked about faith, entered into worship, and told others about God really just don't work in today's world. That said, I think Rob Bell starts out with a truth, but in taking his repainting of the Christian faith to the upmost extreme, he gets on some theological shaky ground. He suggests that his book is not about "dressing up" church or faith, but challenging it and rethinking it. I would challenge all believers to test their faith and strive to challenge themselves, but Rob Bell talks about rethinking and reformatting theology. . . .and there are some points of theology that can't be changed! They just are. I'm not talking about thinking over the things you once believed about God and have now discovered are totally inaccurate descriptions of His character, unbiblical, or simply your projections onto Him. I'm talking about the points of the gospel message, truths about God's character, Jesus' role in salvation, and so forth. Also Bell seems to be positing that heaven will be on earth. I agree with him that the kingdom of God begins in the lives of believers at salvation. The kingdom of God is here and now and later, but Scripture says that Jesus has gone to prepare a place for us. According to the Bible, there will be a new heaven and a new earth. . . . I suspect this means I am not Rob Bell’s ideal audience. I don’t think that my direction in life should be determined by a quest for self-actualization. I most definitely think that ‘being true to oneself’ is a terrible reason to plant a church. I don’t think God chose me because He believed in me, or because He knew I ‘had it in me’. I do not believe God saw my unrealized potential and drafted me to His team. Nor do I believe that my sins are the result of my failure to believe in myself. So yeah, I’m not really Bell’s kind of reader. The book is highly poetic, which increases its resonance but it is still very much a book for Christians. I wish I could recommend it to non-believers as an example of unique and intelligent progressive Christian thinking, but so much of his language depends on at least a cursory knowledge of the faith for the impact to fully set in. That having been said, I am a believer and it resonated tremendously with me (I only killed that fifth star because of the crossover difficulty for non-Christians). The book is highly poetic, which increases its resonance but it is still very much a book for Christians. I wish I could recommend it to non-believers as an example of unique and intelligent progressive Christian thinking, but so much of his language depends on at least a cursory knowledge of the faith for the impact to fully set in. That having been said, I am a believer and it resonated tremendously with me (I only killed that fifth star because of the crossover difficulty for non-Christians). His thoughts are challenging, yet hopeful; they are provocative, yet inspiring. What I most walked away with, however, was the sense that I wasn't crazy for thinking there was more to it all than what I had been taught for so many years. There are deeper places to go and deeper things to experience. Rob Bell has a unique way of looking at the world. As I was reading Velvet Elvis, I felt almost like I was reading a 21st century, not-so-academic, C. S. Lewis. Bell has a knack for creating effective illustrations out of quite mundane items (bricks and walls, trampolines, for example). I say "unacademic" not to imply that Rob Bell is dumb, but only because he lacks that higher style of a C. S. Lewis. I admit that I read Velvet Elvis rather quickly, but I do not recall being struck by anything tha Rob Bell has a unique way of looking at the world. I admit that I read Velvet Elvis rather quickly, but I do not recall being struck by anything that I would call "inaccurate." However, there are some items that he discusses that I am just ignorant of. For example, I am unfamiliar with the "Rabbi's Yoke" as he discusses them. Bell really made waves in his more recent release, "Love Wins", written several years after 'Velvet Elvis". Many now consider him universalist in his theology, though he denies being so. 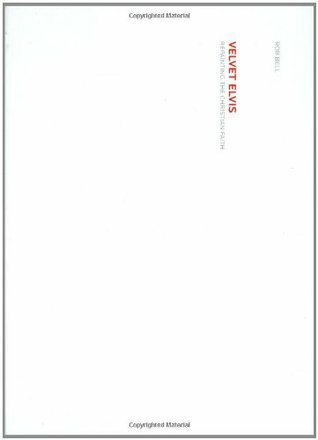 'Velvet Elvis" isn't heavy on theology by any means but does cause the reader to consider things in a bit of a different light. Some could say it opens the doors for a Christian to lose his faith, or at least become more muddled, but that doesn't mean that Christians should steer clear or Bell's ponderings. They Bell really made waves in his more recent release, "Love Wins", written several years after 'Velvet Elvis". Many now consider him universalist in his theology, though he denies being so. 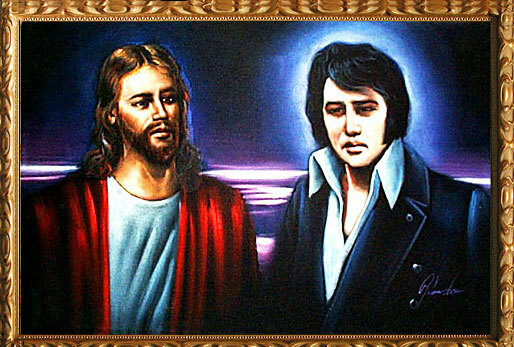 'Velvet Elvis" isn't heavy on theology by any means but does cause the reader to consider things in a bit of a different light. Some could say it opens the doors for a Christian to lose his faith, or at least become more muddled, but that doesn't mean that Christians should steer clear or Bell's ponderings. They are real and they are shared by many. It hit me...that for him faith isn't a trampoline; it's a wall of bricks. Each of the core doctrines for him is like an individual brick that stacks on top of the others. If you pull one out, the whole wall starts to crumble. It appears quite strong and rigid, but if you being to rethink or discuss even one brick, the whole thing is in danger... Remove one, and the whole wall wobbles. ...But if the whole faith falls apart when we reexamine and rethink one spring, then it wasn't that strong in the first place, was it? This is because a brick is fixed in size. It can't flex or change size, because if it does, then it can't fit into the wall. What happens then is that the wall becomes the sum total of the beliefs, and God becomes as big as the wall. But God is bigger than any wall. God is bigger than any religion. God is bigger than any worldview. God is bigger than the Christian faith. This truth clicked for me last Friday in a new way. Somebody showed me a letter from the president of a large seminary who is raising money to help him train leaders who will defend Christianity. The letter went on about the desperate need for defense of the true faith. What disturbed me was the defensive posture of the letter, which reflects one of the things that happens in brickworld: you spend a lot of time talking about how right you are. Which of course leads to how wrong everybody else is. Which then leads to defending the wall. It struck me reading the letter that you rarely defend a trampoline. You invite people to jump on it with you. The Bible is a communal book. It came from people writing in communities, and it was often written to communities. Remember that the printing press wasn't invented until the 1400s. Prior to that, very few if any people had their own copies of the Bible. In Jesus' day, an entire village could probably afford only one copy of the Scriptures, if that. Reading the Bible alone was unheard of, if people could even read. For most of church history, people heard the Bible read aloud in a room full of people. You heard it, discussed it, studied it, argued about it, and made decisions about it as a group, a community. Most of the "yous" in the Bible are plural. Groups of people receiving these words. So if one person went off the deep end with an interpretation or opinion, the others were right there to keep that person in check... You saw yourself and those around you as taking part in a huge discussion that has gone on for thousands of years. ...Contrast this communal way of reading and discussing and learning with our Western, highly individualized culture. In many Christian settings, people are even encouraged to read the Bible alone, which is a new idea in church history. A great idea and a life-changing discipline, but a new idea. And think of pastors. Many pastors study alone all week, stand alone in front of the church and talk about the Bible, and then receive mail and phone calls from individuals who agree or don't agree with what they said. This works for a lot of communities, but it isn't the only way. ON INTERPRETING YOUR BIBLE BIAS-FREE? The problem is, it is not true. I'm actually giving you my opinion, my interpretation of what it says. And the more I insist that I am giving you the objective truth of what it really says, the less objective I am actually being. Obviously we think our interpretations are the most correct; otherwise we'd be changing them. Or as one of my favorite writers, Anne Lamott, put it, 'Everybody think their opinion is the right one. If they didn't, they'd get a new one.'" It is possible for music to be labeled Christian and be terrible music. It could lack creativity and inspiration. The lyrics could be recycled cliches. That "Christian" band could actually be giving Jesus a bad name because they aren't a great band. It is possible for a movie to be a "Christian" movie and to be a terrible movie. It may actually desecrate the art form in its quality and storytelling and craft. Just because it is a Christian book by a Christian author and it was purchased in a Christian bookstore doesn't mean it is all true or good or beautiful. A Christian political group puts me in an awkward position: What if I disagree with them? Am I less of a Christian? What if I am convinced the "Christian" thing to do is to vote the exact opposite? This is why it is impossible for a Christian to have a secular job. If you follow Jesus and you are doing what you do in his name, then it is no longer secular work; it's sacred. You are there; God is there. The difference is our awareness. Missions then is less about the transportation of God from one place to another and more about the identification of a God who is already there. It is almost as if being a good missionary means having really good eyesight. Or maybe it means teaching people to use their eyes to see things that have always been there; they just didn't realize it. You see God where others don't. And then you point him out. Perhaps we ought to replace the word missionary with tour guide, because we cannot show people something we haven't seen. Have you ever heard missionaries say they were going to "take Jesus" to a certain place? What they meant, I assume, was that they had Jesus and they were going to take him to a place like China or India or Chicago where people apparently didn't have him. I would ask them if people in China and India and Chicago are eating and laughing and enjoying things and generally being held together? Because if they are, then Jesus, in a way that is difficult to fully articulate, is already present there. So the issue isn't so much taking Jesus to people who don't have him, but going to a place pointing out to the people there the creative, life-giving God who is already present in their midst. It is searching for the things they have already affirmed as real and beautiful and true and then telling them who you believe is the source of all that. "I am here to tell you where I think it comes from..."
And if you do see yourself carrying God to places, it can be exhausting. God then makes people whom he puts right in the middle of all this loaded creation, commanding them to care for creation, to manage it, to lovingly use it, to creatively order it. The words he gives are words of loving service and thoughtful use. From day one (which is really day six), they are in intimate relationship and interaction with their environment. They are environmentalists. Being deeply connected with their environment is who they are. For them to be anything else or to deny their divine responsibility to care for all that God has made would be to deny something that is at the core of their existence. This is why litter and pollution are spiritual issues. To be this kind of person - the kind who selflessly serves - takes everything a person has. It is difficult. It is demanding. And we often find ourselves going against the flow of those around us. Which is why we are reclaiming the simple fact that Jesus said the way is narrow. We are honest about this, especially to our friends who wouldn't say they are Christians. Very few people in our world are offering anything worth dying for. Most of the messages we receive are about how to make life easier. The call of Jesus goes the other direction: It's about making our lives more difficult. It is going out of the way to be more generous and disciplined and loving and free. It is refusing to escape and become numb to and check out of this broken, fractured world. ...In John 6 [Jesus] gives a teaching that is so hard to swallow, everybody but a few leave him. He is constantly trying to find out who really wants it. And so he keeps pushing and prodding and questioning and putting it out there until some leave and the diehards stay. We never find him chasing after someone, trying to convince them that he really wasn't that serious, that it was just a figure of speech. He didn't really mean sell your possessions and give to the poor. If anybody didn't have a Messiah complex, it was Jesus. That is what we are all dying for - something that demands we step up and become better, more focused people. Something that calls out the greatness that we hope is somewhere inside of us. Ultimately our gift to the world around us is hope. Not blind hope that pretends everything is fine and refuses to acknowledge how things are. But the kind of hope that comes from staring pain and suffering right in the eyes and refusing to believe that this is all there is. It is what we all need - hope that comes not from going around suffering but from going through it. I am learning that the church has nothing to say to the world until it throws better parties. By this I don't necessarily mean balloons and confetti and clowns who paint faces. I mean backyards and basements and porches. It is in the flow of real life, in the places we live and move with the people we're on the journey with, that we are reminded it is God's world and we're going to be okay. Food is the basis of life, it comes from the earth, and the earth is God's. In a Jewish home in Jesus' day - and even now - the table is seen as an altar. It's holy. Time spent around the table with each other is time spent with God. Rob Bell is undoubtably a controversial figure in the Christian world... he’s a voice that angers and terrifies the strongest hardliners of the faith. I have heard it said that church employees love Rob Bell books but are afraid to display them on their shelves at work.. wow, really?!?! I really enjoyed this book. One thing is clear Bell loves the church, despite how he’s been treated by it. “The church is like a double edged sword, when it is good, when it’s on, when it’s right, it’s like nothi Rob Bell is undoubtably a controversial figure in the Christian world... he’s a voice that angers and terrifies the strongest hardliners of the faith. I have heard it said that church employees love Rob Bell books but are afraid to display them on their shelves at work.. wow, really?!?! I really enjoyed this book. One thing is clear Bell loves the church, despite how he’s been treated by it. Bell encourages every believer to return with eyes of innocence, meaning to always look for good and to not choose bitterness, resentment, and anger when things go bad. Yes, address it, call it out but don’t stay there. Jesus is making all things new, not just once but everyday. Rob encourages people to love with no agenda. Stop using word like saved or referring to those who don’t believe like others, non, in, or outsiders, it’s offensive, you know what he’s right. Stop putting people into categories, it’s rude. God shows no favoritism. See all people as God sees them, made in His image, not the image systems and people have decided they should be. In the gospels Jesus doesn’t chase anybody, He engages, listens, dines with, tells stories, and lets arguments happen. He helps, He loves, He forgives, He laughs, He weeps, He heals. In short, people like Him, be like Him. “If there was anybody who didn’t have a Messiah complex, it was Jesus. “If the gospel isn’t good news for everybody, then it isn’t good news for anybody.” The gospel is simple, people make it complex. 4.5 stars because there's no denying this book is written in an engaging way. The metaphors and punchy language keep the pages turning. But for me the content of the book is illustrated by this little snippet: a couple has asked Bell to officiate their marriage and Bell writes, "They said they didn't want any Jesus or God or Bible or religion to be talked about. But they did want me to make it really spiritual. The bride said it in her own great way, 'Rob, do that thing you do. Make it really pro 4.5 stars because there's no denying this book is written in an engaging way. The metaphors and punchy language keep the pages turning. But for me the content of the book is illustrated by this little snippet: a couple has asked Bell to officiate their marriage and Bell writes, "They said they didn't want any Jesus or God or Bible or religion to be talked about. But they did want me to make it really spiritual. The bride said it in her own great way, 'Rob, do that thing you do. Make it really profound and deep and spiritual.'" The chapter ends by Bell saying that wherever you find passion and love and exhilaration, you find Jesus. So the couple was closer to Jesus than they could have ever imagined. Reading this book can help a person to make better sense of the Rob Bell phenomenon. It was written before there was any controversy around his name, and in this book readers encounter a writer who wants to see Christianity existing in its best possible form. This book in particular presents some powerful thoughts about our need to re-think. Rob is not calling for Christians to reinvent the wheel, but he does want to see us spending time critically evaluating whether or not the Christianity we a Reading this book can help a person to make better sense of the Rob Bell phenomenon. It was written before there was any controversy around his name, and in this book readers encounter a writer who wants to see Christianity existing in its best possible form. This book in particular presents some powerful thoughts about our need to re-think. Rob is not calling for Christians to reinvent the wheel, but he does want to see us spending time critically evaluating whether or not the Christianity we are embracing in the 21st Century is at all what God intended.